EMC testing is necessary in ensuring that product immunity from several sources of transient phenomena and continuous radio frequency phenomena that are present in the electromagnetic environment. The transient events can be from natural causes - electrostatic discharge (ESD), lightning or man made - fault surges, switching transients. 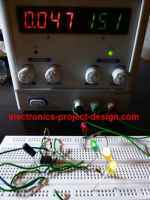 These involve very short duration events in the region of nanosecond or microsecond that have high amplitudes that can disrupt or destroy electronics circuits and components in a electronic device. It is also necessary in ensuring that a product does not create electromagnetic emission that are too high which will cause damage to nearby equipment or device. The limit of emission is used as a standard to ensure that all products that comply to the EMC Directive meets this requirements before it can be marketed to the public in countries where these standards are used. A few major transient immunity testing that are used widely in the testing of electronics products are listed and illustrated as below. It will explain in detailed the methodology and standards used to simulate the real life phenomena of this type of transients. If a person walked through a highly insulating material and low relative humidity, his body voltage can be charged up to as high as 25kV. When his body touched any electronics device or components, this charge is discharged and could cause disruption or damage to the device. When a circuit is switched off, the current flowing through the switch is interrupted instantaneously. This causes the air gap across the contacts to break down, and current flows again, which collapses the voltage spike. This burst characteristics can caused damaged to a device nearby. These are high energy transients appearing at the ports of electronic devices that are generated as a results of nearby lightning surges, or power disturbances such as fault clearance or capacitor bank switching. The radio frequency (RF) spectrum is becoming more and more congested as more electronic device is expected to exist together with radio transmitters of many kinds. As such, device is expected to be tested for immunity according to standard defined in order for it to differentiate itself from other products. Testing and methodology of RF Immunity according to IEC standards are provided here. Radio frequency emissions tests are one of the basic requirements for electromagnetic compatibility compliance of most electronic and electrical products. RF Conducted and Radiated Emission tests standards and methodology are provided here.